Happy Death Day wasn’t the first movie to play with the concept of time loops. We’ve seen the “repeat the same day” premise done everywhere from Groundhog Day to Edge of Tomorrow. For such an overused setup, though, Christopher Landon’s film was refreshingly well-plotted, witty, and wickedly entertaining. It also experimented with several slasher tropes, almost playing out like a satire of horror movies without ever quite going into “Scary Movie” territory. As pleasantly surprising as Happy Death Day was, you wouldn’t expect a sequel to maintain the same energy or passion. Whenever a quality horror movie comes along, it’s typically followed by a slew of uninspired sequels that just rehash the established blueprint. Since the first film was literally about déjà vu, Happy Death Day 2U seemed to be setting itself up to fall on its own sword. This franchise somehow manages to continually defy the odds, though, as the sequel isn’t just on par with its predecessor, but arguably even better. This is a rare follow-up that actually justifies its existence, answering questions the original left up in the air and evolving ideas you thought had run their course. Like Back to the Future Part II, it’s a sequel that’s familiar in some respects and completely different in others. The audience can tell they’re in store for something new from the opening scene, which shifts the focus to Phi Vu’s Ryan, who barely got more than a couple lines in the first movie. Now he’s the one being hunted by a mysterious murderer in a baby mask, starting his day over every time the killer strikes. It doesn’t take long for Ryan to enlist the help of his roommate Carter (Israel Broussard) and Tree Gelbman (Jessica Rothe), who’s died so many times already that this is all fairly routine for her. Where the original didn’t even make an attempt to explain how the time loop occurred, this film offers an explanation that paves the way for several fun new plot elements. 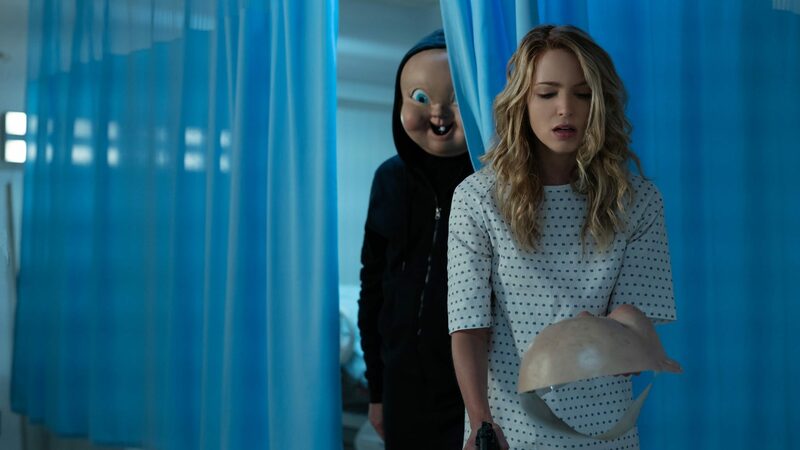 Just when it looks like Happy Death Day 2U may run the risk of literally repeating itself, the screenplay flips the formula on its head and takes us to uncharted territory. The film is just as much a sci-fi comedy as it is a horror mystery this time around. That being said, those who want a more traditional slasher flick may be disappointed, as most scenes are played for laughs rather than scares. This franchise is less about being frightened, though, and more about being creative in a creepy environment. The same can be said about Scream or Gremlins. What’s more, anyone looking for something unique out of the genre will certainly find it here. Happy Death Day 2U is smarter, funnier, and even more emotional than its predecessor. No joke, the protagonist faces a genuinely heartbreaking ethical decision that’ll have everyone in the audience contemplating what they would do in her shoes. It’s also more of an ensemble piece with every cast member having a blast, particularly Rachel Matthews as the two-faced sorority girl Danielle. It’s Jessica Rothe’s performance that once again makes the movie, however, winning us over his charm, humor, and empathy. It seemed like the first film did everything possible with Tree’s character act, but if the sequel proves anything, it’s that there’s room for a third death day. This entry was posted in Reviews and tagged Horror, Mystery, Thriller on February 13, 2019 by Nick Spake.